Take 8 to 9 stale pieces of Braum’s Rustic Country Sandwich Bread and toast individually in a toaster or toaster oven. The bread should be very dry. Cut into cubes. In medium-sized, non-stick skillet brown sausage for 6 to 7 minutes, or until the sausage is thoroughly cooked. Drain the sausage and set aside. In a large mixing bowl, whisk together eggs, milk, pepper, salt, and cumin until well combined. Prepare a 9-x-13 inch baking dish with cooking spray and begin to layer your ingredients. Place toasted bread cubes in the bottom of the baking dish. Sprinkle over the cooked sausage, chopped bell pepper, and one cup of the shredded cheese. Pour egg and milk mixture slowly over the entire dish, making sure to evenly cover all the toasted bread cubes. 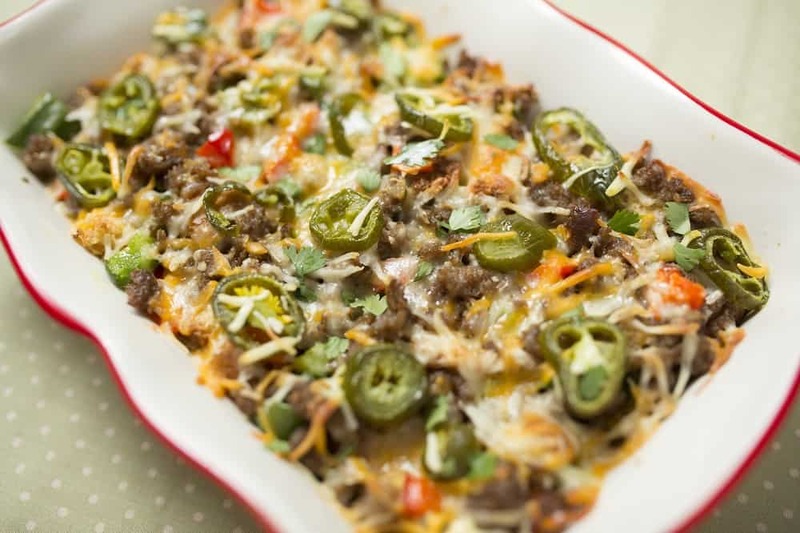 Sprinkle over the remaining cheese and sliced jalapeños to taste. Cover with foil and allow to sit in a refrigerator for at least several hours or overnight. Remove dish from the refrigerator and allow to sit at room temperature while the oven gets warm. Then, place dish in the oven when ready and bake for 1 hour and 30 minutes, or until the top of the casserole is golden brown and egg is cooked through.